Geothermal energy is a clean, reliable, and domestic source of energy that offers constant electricity while emitting relatively few emissions of carbon dioxide and other pollutants. Despite these benefits, its development globally has not been as rapid in recent years as that of other renewable energy sources. We examine Indonesia as a case study— while home to over a third of the world’s geothermal resources, the country exploits only 5.8% of it. Moreover, as a rapidly developing economy with projected electricity growth of 8.5% per year until 2025, Indonesia must harness its geothermal potential if it is to meet electricity needs without requiring the fossil fuels upon which it has historically been reliant. However, significant roadblocks impede geothermal development in Indonesia, primarily in the geoscientific, financial, and political spheres. Firstly, there is a lack of geologic data crucial to preliminary geothermal potential assessment, rendering it difficult to locate available resources. Financial issues also deter investment in geothermal development by private companies due to the high up-front cost of preliminary resource exploration. Lastly, an uncertain political and regulatory environment create uncertainty for geothermal investors. 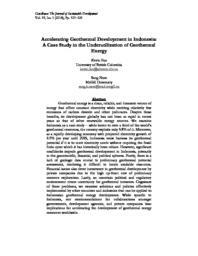 Cognizant of these problems, we examine solutions and policies effectively implemented by other countries and industries that can be applied to Indonesian geothermal energy development. While specific to Indonesia, our recommendations for collaborations amongst governments, development agencies, and private companies bear implications for accelerating the development of geothermal energy resources worldwide.